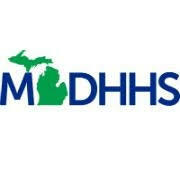 Michigan Congresswoman announces grant for ACCESS to help prevent youth substance abuse. August 29, Congresswoman Debbie Dingell (MI-12) announced that that Arab Community Center for Economic & Social Services (ACCESS) in Dearborn will receive $125,000 grant from the Office of National Drug Control Policy and Drug-Free Communities Support Program to implement programs to prevent youth substance use, including abuse of prescription drugs, marijuana, tobacco, and alcohol, according to Dingell's office. The ACCESS Substance Abuse and Tobacco Prevention/Cessation program provides Dearborn students and parents with the information and skills necessary to make healthy choices about drugs, alcohol, and smoking. Much of the program’s work focuses on the hookah or argileh, a tobacco water-pipe popular among Arab Americans and others. In addition to tobacco, the program educates local youth and parents on the risks of marijuana, alcohol, and prescription drugs. "This critical funding will help ACCESS continue their important work in addressing the serious risks of drug and tobacco use," said Dingell. "Tackling the substance abuse problem in our local community will need local solutions. I will continue to work with ACCESS and others to address the substance abuse and erase the stigma associated with mental health issues." This according to a media release from Dingell's office. As stated in the August 29 press release from Congresswoman Dingell, prescription drug abuse prevention is one of the core measures of effectiveness for local Drug-Free Communities coalitions, and coalitions nationwide have led innovative opioid prevention initiatives. Drug-Free Communities’ 2017 National Evaluation End-of-Year Report found that at least 97% of middle school and 94% of high school youth report that they have not misused prescription drugs in the past 30-days in Drug-Free Communities. Flint Activist Melissa Mays On Day #1559 of Flint Water Crisis. Downtown Flint. Photo Purple Walrus Press. Contributed to PWP by Melissa Mays of Flint. Looks like it's another day of Justice and Clean Water for residents of Flint. Oh... wait... got that backwards. 😡 But it IS Day #1559 in the #FlintWaterCrisiswith no justice, clean water or recovery for most. And a note taped to my door about my latest lead test. Fun. Class Action Lawsuit update: We are still in the fight!! Wouldn't it be nice if the State and all responsible parties said "Innocent Flint residents, we are sorry we failed you (like Governor Snyder said Jan 2016) so let's hear what YOU need to start to rebuild your bodies, homes and lives." Oh, wouldn't that be lovely. For the people that participated in the poisoning of our city, who ignored our cries for help and who covered it up as people suffered and died actually did what is right and fixed what they broke?!?!?! Hmmm... Luckily for us, we have attorneys that will not stop fighting until we see #Justice4Flint!!! DO NOT GIVE UP!!! Rutherford Pool Kids Triathlon at Recreation Park in Ypsi Saturday: Summertime Fun, smiles and Sweat. 90 talented, determined and most athletic kids aged 4-12 proudly participated in the annual Rutherford Pool Kids Triathlon event Saturday morning at Recreation Park in Ypsilanti. It is safe to say that all involved, from our young Ypsi athletes, to the large crowd of spectators, left the event wearing big smiles! The annual event also featured face painting, juggling and food for participants. Not bad! The non-competitive triathlon is a fundraiser for Rutherford Pool presented by the Ypsilanti Kiwanis in cooperation with Friends of Rutherford Pool. According to co-organizer Amyleigh Johnson the Triathlon event Saturday raised over $2,000 for Rutherford Pool. The event entailed swimming, biking, and running. Although the event was non-competitive, the challenge was to finish the course. However, I must admit that I couldn't help cheering my daughter on to victory! EMU Police Dept 1st Annual Bike Rodeo A Big Hit With Area Youth in Ypsilanti Saturday at Convocation Center. EMU Police Officer Tim Siecinski takes a participant through the bike course Saturday. Photo Purple Walrus Press. The 1st Annual Eastern Michigan University Police Dept Bike Rodeo was a rousing success with kids and the entire community Saturday at the EMU Convocation Center in Ypsilanti. Temperatures hovering in the upper 80's did not dampen the fun for Ypsi kids or the many participating EMU police officers who were having just as much fun as the kids were. The event ran from 10 am until 2 pm. The Bike Rodeo was free and welcomed all ages, but the kids ruled the day as moms and dads happily looked on. The event included a free safety check and helmet fitting. EMU police officers provided kids instruction on the rules of the road, helped them practice their skills, taught them bike safety, provided food and handed out lots of cool free stuff. That's hard to beat! The Bike Rodeo was coordinated by EMU Police Sgt Joe Torres and it was clear through speaking with him that the department is very intent on building a positive relationship with the Ypsilanti community and that's pretty fantastic. Fraser Bicycle located on Packard St between Ypsilanti and Ann Arbor set up a tent at the event and donated 20 free bike helmets, stickers and water bottles, according to General Manager of Sales Ed Renauer. A strong and steady flow of kids participated in the Bike Rodeo Saturday. As of 11:30 am an impressive 60 kids had participated in the 1st annual Bike Rodeo. Make sure to come on out again when the event returns next year! Making an appearance Congresswoman Debbie Dingell. Hold on to your Horses! 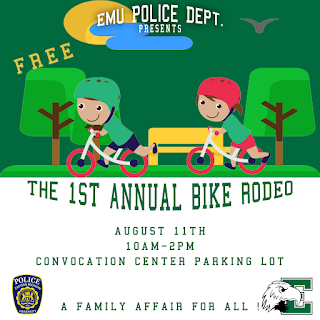 EMU Police Dept Bike Rodeo is coming Saturday August 11 to Convocation Center in Ypsilanti! 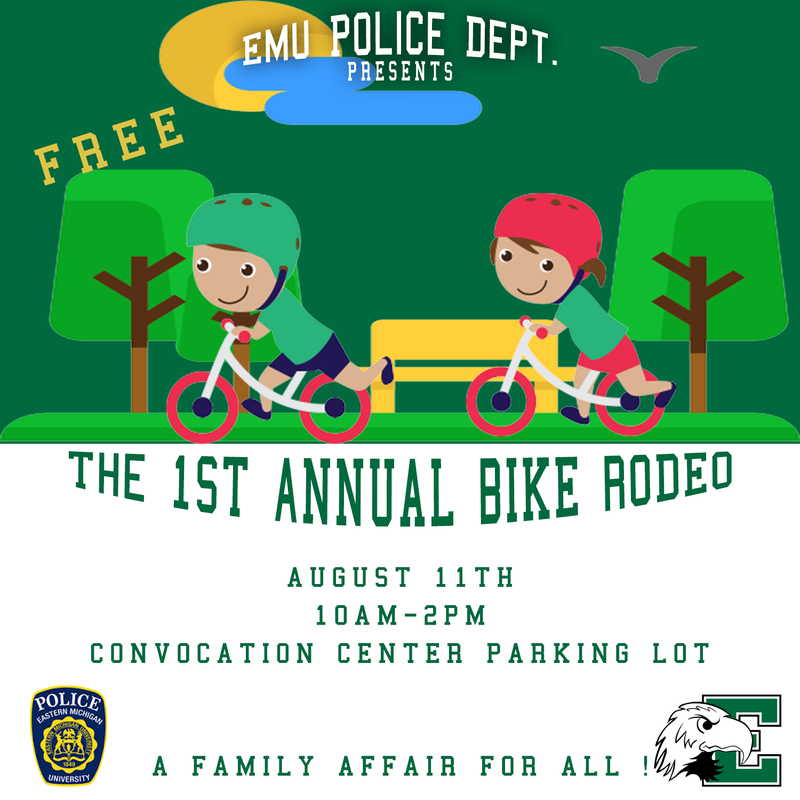 Hold on to your horses, I mean bicycles, because this weekend, Saturday, August 11, the Eastern Michigan University Police Department will be holding their first Bike Rodeo at the EMU Convocation Center in Ypsilanti. The event is free and will be held from 10 am until 2 pm. The Bike Rodeo will welcome folks of all ages, but kids need to bring a parent. This most awesome event will include a free safety check and helmet fitting. Participants can also learn the rules of the road, practice their totally awesome skills learn how to bike safely and there will be food and drinks available to boot! How cool is that?! Oh, there will also be free stuff. I love free stuff! As of Tuesday morning voter turnout looks strong in Ypsi for primary. According to Ward 2 primary election volunteers at Estabrook Elementary in Ypsilanti voter turnout has been strong and steady. The high turnout is not surprising as large numbers of residents in Ypsilanti and Washtenaw County have taken a vested interest, perhaps more so this primary election than previous elections. This may be in large part due to the numbers of highly charged campaign rallies in Ypsilanti over recent weeks in support of governor candidate Abdul El-Sayed. A little over a week ago several hundred residents packed Brown AME Church in Ypsilanti for a rally for El-Sayed that featured supporter and new energetic face of the Democratic Party Alexandria Ocasio Cortez of New York. A rally for Abdul El-Sayed this past Sunday at the Marriott Eagle Crest Hotel in Ypsilanti featuring speaker Bernie Sanders drew roughly 1000 people in the sweltering heat. Notable near the entrance of the Ypsilanti Ward 2 voting site Tuesday morning was the presence of a group supporting Proposal 2 which would amend the Michigan Constitution to create an independent redistricting commission. Proposal 2 will appear on the ballot in November. Large Crowd in Ypsilanti Shows Support In Sweltering Heat For Abdul El-Sayed Rally With Bernie Sanders Sunday. Temperatures soaring into the the mid nineties did not discourage the enthusiasm of approximately 1000 sweltering supporters as they cheered candidate for governor Abdul El-Sayed and Bernie Sanders at the Abdul For Michigan Get Out The Vote Rally with Bernie Sanders at the Eagle Crest Marriott Hotel in Ypsilanti Sunday. The event was held on the rolling back lawns behind the hotel adjacent to the golf course that happened to be teeming with golfers during the rally. The picturesque setting provided an interesting backdrop to the inspiring rally that was bursting with palpable optimism, enthusiasm and dissatisfaction with the status quo. Those attending the rally responded to speakers with passion and exuberance as they melted in the heat. Not a soul left the rally uninspired because the messages from Abdul El-Sayed and Bernie Sanders rang loud, true and right on target. "People in Michigan are good people. We must reach beyond the division and hatred between people," stated El-Sayed to the riveted crowd. "When will we stand up for healthcare for all." "Why is it that people in Flint still don't have clean water?" At approximately 6:45 pm Bernie Sanders was met by loud cheers as he approached the podium to stir up support for the Abdul for governor campaign. "We are not going to allow demigods to divide us up. We are going to come together!" stated Sanders. "This is a transformative election. This is saying here in the United States we want to do things differently." Sanders message was clear and neatly summed up the positive and important mission in the Abdul For Governor campaign when he stated, "We should not have a president who is dividing us up based on color and ethnicity. With days left before the primary election the campaign for Abdul El-Sayed could not have done a finer job getting out their message of change and defeating the status Quo and just as importantly, Getting Out The Vote. A golfer cheers for Bernie from her golf cart. Senator Bernie Sanders campaigning with candidate for governor Abdul El-Sayed in Ypsilanti and Detroit Sunday. According to a media release from the Abdul El-Sayed campaign, on Tuesday, United States Senator Bernie Sanders announced that he will travel to Michigan to campaign for Democratic gubernatorial candidate Dr. Abdul El-Sayed. Senator Sanders will speak at two rallies in Detroit and Ypsilanti on Sunday, August 5th, alongside Our Revolution President Nina Turner. The campaign tour comes as Abdul El-Sayed continues to surge in the final days of Michigan’s Democratic gubernatorial primary election. In 2016, Senator Sanders won the Michigan Democratic primary in one of the greatest upsets in modern political history, having never led in a poll in the state. Senator Sanders is a key progressive standard-bearer nationwide. Senator Sanders is the only member of the United States Senate to make an endorsement in this race, according to the press release. Abdul was also recently endorsed by Alexandria Ocasio-Cortez, and his bold, progressive platform has earned his candidacy a number of endorsements from progressive organizations like Our Revolution, the Progressive Change Campaign Committee, Working Families Party, Democracy for America, Justice Democrats, The People for Bernie Sanders, and the Michigan Nurses Association. Abdul has also earned the support of progressive leaders like Congressman Ro Khanna, State Representative Abdullah Hammoud, Chuy Garcia, Michael Moore, Shaun King, Linda Sarsour, and Ady Barkan, according to Friday's release. To see Abdul’s full list of endorsements, visit AbdulForGovernor.com/endorsements. Ohio State Football / Urban Meyer debacle: Pattern of of domestic cases against assistant coach Zach Smith depicted by police reports according to OSU student run publication. 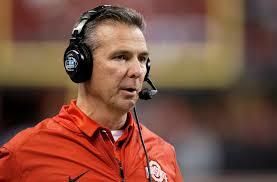 According to The Lantern which is the Ohio State University student run and published news publication, the Lantern obtained police reports stating that Ohio State wide receivers coach Zach Smith displayed a history of domestic incidents that were previously reported to the police by Smith's ex-wife Courtney Smith. Ohio State fired Zach Smith on Friday, July 23 as a result of allegations that surfaced of domestic violence that involved Courtney Smith. According to the Lantern, Smith filed for domestic violence civil protection order on July 20th. Flint families can receive nutritious food at mobile food pantry in August. According to the Michigan Dept of Health and Human Services, Flint families may get nutritious food that can limit the effects of lead exposure during mobile food pantry hours set for August at locations throughout Flint. Thursday, Aug. 2, at 10 a.m. – Greater Holy Temple, 6702 N. Dort Hwy. Monday, Aug. 6, at 10 a.m. – Bethel United Methodist Church, 1309 Ballenger Hwy. Tuesday, Aug. 7, at 10 a.m. – Catholic Charities of Shiawassee and Genesee Counties, 910 Chippewa St.
Tuesday, Aug. 7, at 10 a.m. – Asbury United Methodist Church, 1653 Davison Road. Wednesday, Aug. 8, at noon – Salem Lutheran Church, 2610 Martin Luther King Ave.
Thursday, Aug. 9, at 10 a.m. – Greater Holy Temple, 6702 N. Dort Hwy. Friday, Aug., at 10 a.m. – Flint Muslim Food Pantry, 4400 S. Saginaw St.
Monday, Aug. 13, at 10 a.m. – Bethel United Methodist Church, 1309 Ballenger Hwy. Tuesday, Aug. 14, at 10 a.m. – Asbury United Methodist Church, 1653 Davison Road. Wednesday, Aug. 15, at 10 a.m. – Hispanic Tech Center, 2101 Lewis St.
Thursday, Aug.16, at 10 a.m. – Greater Holy Temple, 6702 N. Dort Hwy. Friday, Aug. 17, at 10 a.m. – St. Luke’s NEW Life Center, 3115 Lawndale Ave.
Monday, Aug. 20, at 10 a.m. – Bethel United Methodist Church, 1309 Ballenger Hwy. Tuesday, Aug. 21, at 10 a.m. – Catholic Charities of Shiawassee and Genesee Counties, 910 Chippewa St.
Tuesday, Aug. 21, at 10 a.m. – Asbury United Methodist Church, 1653 Davison Road. Thursday, Aug. 23, at 10 a.m. – Greater Holy Temple, 6702 N. Dort Hwy. Friday, Aug. 24, at 10 a.m. – NOW Ministries, 1200 Stocker Ave.
Monday, Aug. 27, at 10 a.m. – Bethel United Methodist Church, 1309 Ballenger Hwy. Tuesday, Aug. 28, at 10 a.m. – Asbury United Methodist Church, 1653 Davison Road. Thursday, Aug. 30, at 10 a.m. – Greater Holy Temple, 6702 N. Dort Hwy. Flint residents can also pick up free nutritional food at the three Flint Help Center locations. They are Bethel United Methodist Church, 1309 N. Ballenger Highway, open from 10 a.m.-2 p.m. Mondays; Asbury United Methodist Church, 1653 Davison Road, open Tuesdays from 10 a.m.-2 p.m. and Greater Holy Temple, 6702 N. Dort Highway, open Thursdays from 10 a.m.-2 p.m.